I get confused easily, I admit it. But one of the things that confuses me a lot when pupils explain their life, is the family set up. So I have started to rely on Genograms a lot more. Ok I admit that I also like stationary and different colour pens, so a Genogram gives me a chance to use them, but the pupils like the clarity of it and the fact that they can see if I understand their life. They can be a little challenging to start with. I always want to start in the middle, with the child the centre of everything but this doesn’t happen on paper nor in the real world. I also find that as I talk further to the child, there are discrepancies with their feelings. For example, ask them how their relationship is with their sister and the answer normally is “depends on a lot of things” but then I have started to come up with a lot of different codes now. The more I practise the more useful I find it. 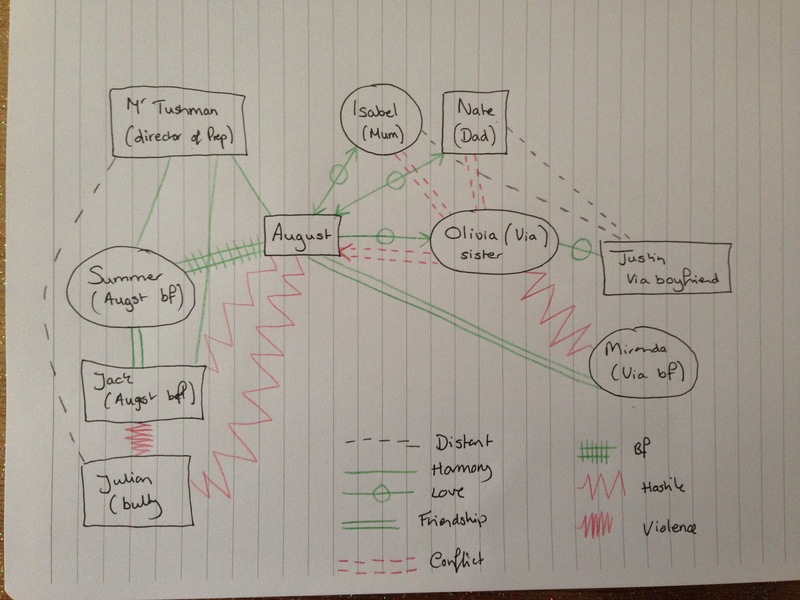 So my top tip today is read a book / watch a film and then do a Genogram. It doesn’t even have to be high brow. I am not a Bridgit Jones fan but I can image that would be a perfect case to practice on. OR what about Harry Potter? I have just finished reading Wonder with my daughter, ( really great book, excellent for #pshe resources ) so here is my Genogram for August. Don’t think it’s perfect but my daughter and I learnt a lot discussing feeling of each character.